and I will present again! It is again spring. And it’s time for Microsoft NetWork again. My “home” conference this year has its 8. 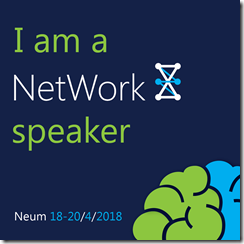 Edition, and I will be there, presenting about Microsoft Flow Custom connectors. Besides that, I am super excited to present at European Collaboration Summit. On biggest community (not-for-profit) conference about SharePoint and Office 365 in Europe I will present my session about Microsoft Graph and Azure Functions.